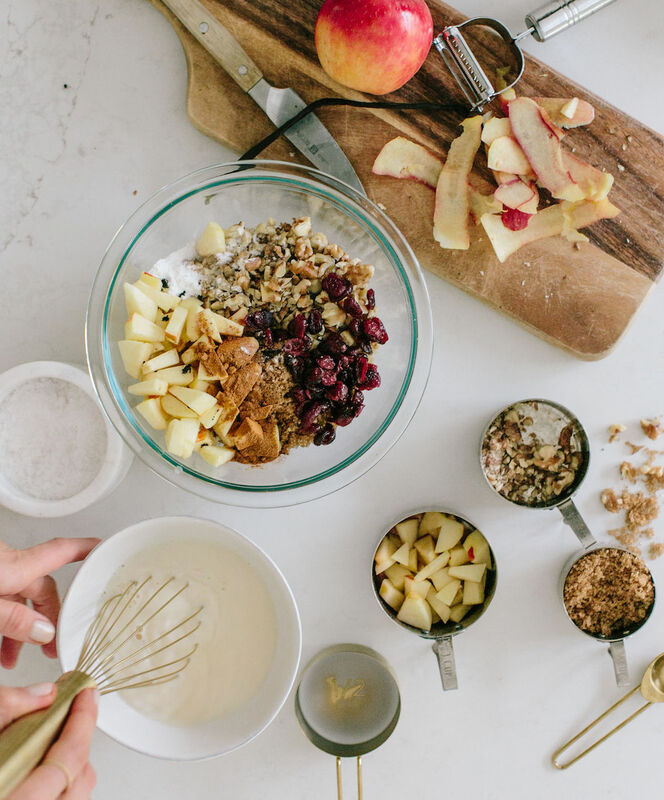 We’ve been in a breakfast RUT around here lately – scrambled eggs, smoothies, and oatmeal on repeat. 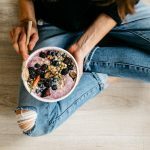 When you’re juggling work and school and workout schedules with trying to get out the door, there’s no question that speed is the name of the game for weekday morning meals – and they’ve got to be at least semi-healthy, too. That’s why I love a make ahead breakfast that I can leisurely whip up on a Sunday night, then pop in the oven (or microwave, let’s be honest) when we’re in the mad dash to get out the door. 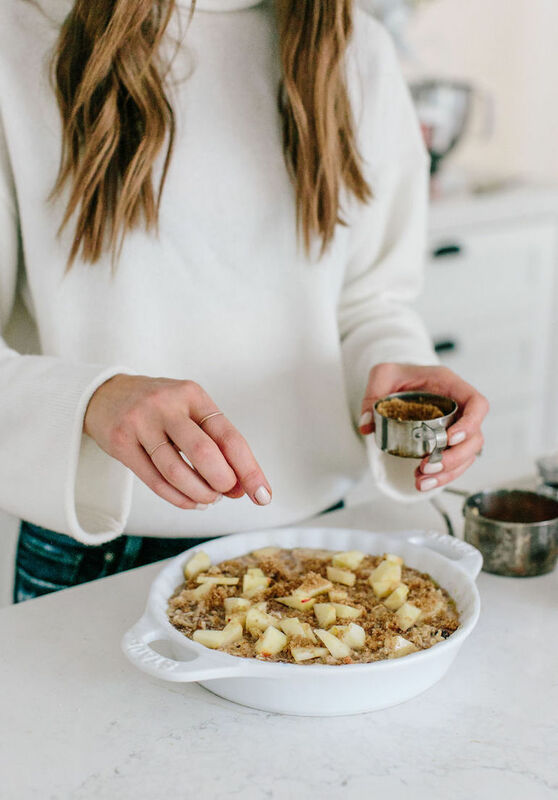 This Apple Pie Baked Oatmeal gets crowned the favorite by everyone at my house. 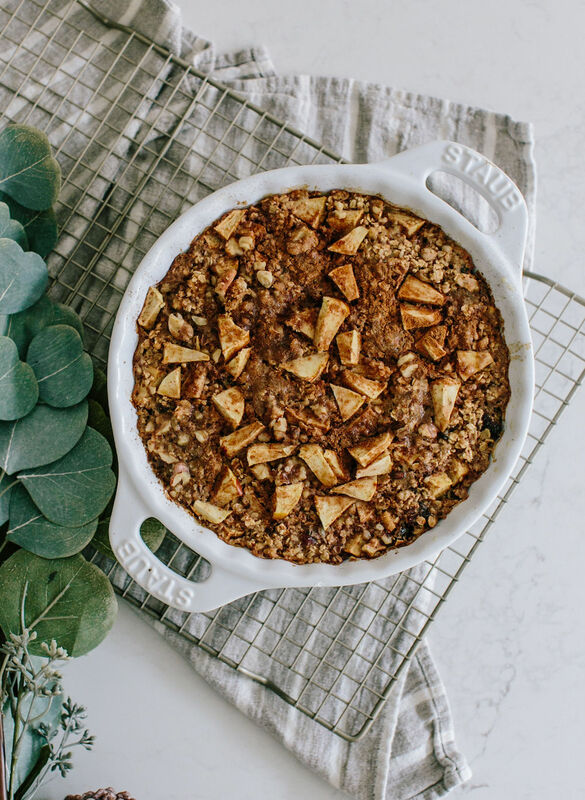 Apples, walnuts, and oats get baked in cinnamon and sugar, and the results taste, well, pretty much like apple pie. 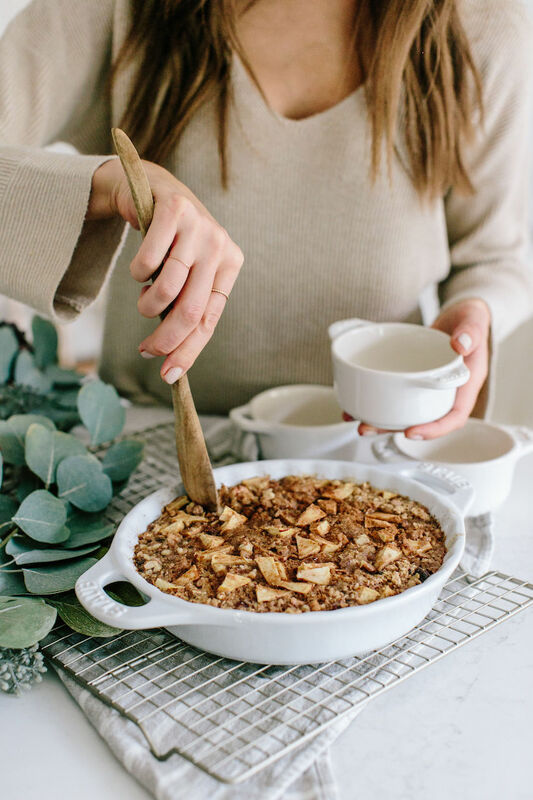 It can easily be made gluten-free (just use “gluten-free rolled oats”) and vegan (use almond milk and sub coconut oil for butter) so everyone can dig in, regardless of dietary restrictions. I usually bake this on the weekend, put the entire baking dish in the fridge, and then reheat single-sized portions with a little milk the next morning. And the next, and the next, since this baby is perfectly good for 3 or so days in the fridge. And the addition of eggs and walnuts turns oatmeal into a dish with some protein and a good dose of omega-3’s to start the day. Scroll on for the recipe, as well as a few ideas for ingredient swaps so you can make this with whatever you have on hand. Instead of walnuts, use toasted pecans or slivered almonds. Sub orange juice if you don’t have apple juice. Preheat oven to 350°F and spray a large baking dish with nonstick cooking spray. 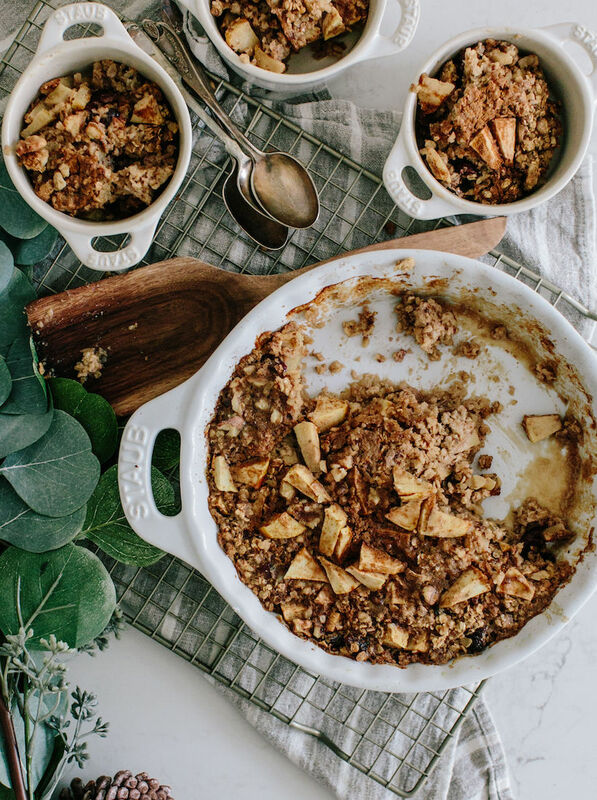 In a mixing bowl, add the oats, brown sugar, 3/4 cup of the walnuts, baking powder, cinnamon, and salt, and thoroughly combine. In a separate mixing bowl, add the eggs, milk, apple juice, and vanilla extract and whisk until the eggs are completely combined. Pour the egg mixture and the melted butter into the dry ingredients and stir together until just mixed. In a large baking dish, arrange the apples into one even layer. Pour the oat mixture over the apples and evenly distribute the remaining walnuts. Bake for 45 minutes, until the top is golden and the oats are set throughout. Serve warm, or refrigerate and reheat the next day. Step 2 calls for pecans, pumpkin seeds and coconut. Apple juice is listed in the ingredients also but is not used in the recipe. Please email me with the correction. Hi Lisa! Take a look at the updates and let me know if you have any other questions– hope you enjoy!! You offered subs to make it vegan. Would flax seed work as a sub for eggs? Yes! If you actually make a “flax egg”: mix one tablespoon ground flaxseed meal with three tablespoons of water. Mix together, and let sit in your fridge for 15 minutes to set up and thicken. Let us know how it goes!